I did not know Huw personally, but from what I have heard from people who did know him, he was a great guy, a generous man, both to those he knew and to his fans. Sadly, he was taken from us late in 2012, but he has left a great legacy of music behind which includes this fine compilation. Most readers here will know Huw as one of the founding members of Hawkwind, and as one of its guiding lights throughout the 80’s. A first-rate guitarist, Huw was also a great songwriter, contributing memorable songs to the Hawkwind canon such as Rocky Paths, Waiting for Tomorrow, The Sea King and Moonglum, as well as co-writing many other songs from the band’s 80’s era. Huw also liked instrumentals, and contributed tracks like the frenetic Space Chase and the haunting Tides to Hawkwind’s albums. But Huw also had a solo career, releasing nine albums with the Lloyd-Langton Group, two albums with hard rock band Widowmaker, as well as other contributions and collaborations. Huw’s versatility as a musician is only outdone by the sheer emotional intensity he pours into his playing, and both those aspects can be heard on this interesting and eclectic collection. Disc 1 starts with 11 solo acoustic songs written by him and his wife Marion, and recorded in 1971, the year after he left the founding line-up of Hawkwind. Reading Dave Thompson’s liner notes inside the CD case, you learn the story of Huw and Marion’s life at the time, and it adds another note of emotional poignancy to the songs, which draw on rock, blues and English folk traditions. These songs are Huw stripped down to the basics, at his rawest and most emotional, and they are a superb document of a time in his life when all seemed lost, yet anything seemed possible. 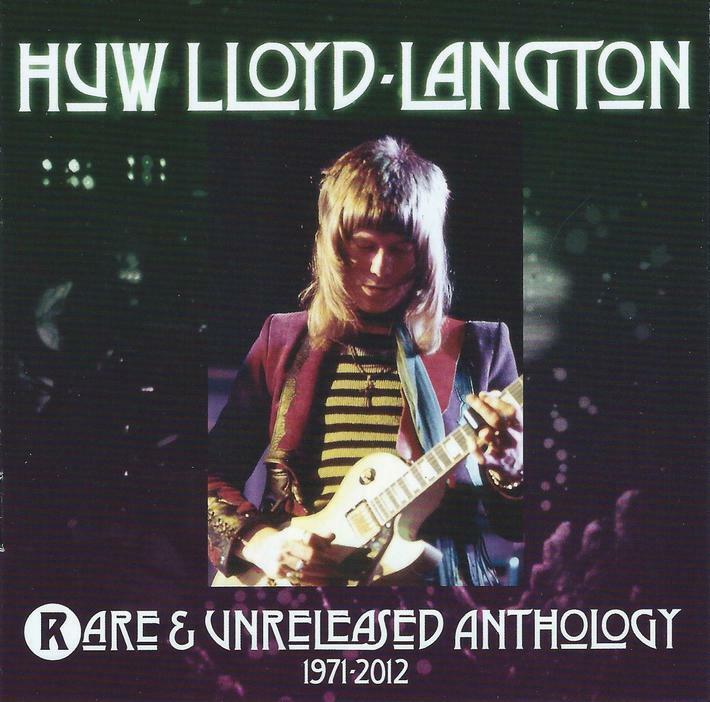 Included is the original acoustic version of Night Air (here called Painted Evergreen), which would appear in a much more electrified style on the first proper Lloyd-Langton Group album. Also on disc 1 are four tracks from the short lived band Magill. Again we hear Huw’s enormous versatility, whether he’s playing the heavy rock of Rag Man, the country stomp of Feed Your Friends with a Long Handled Spoon, the folksy balladry of I Can’t Be Satisfied, or plowing through a powerful and energetic cover of Don’t Let Me Be Misunderstood. Most of the rest of disc 1 is filled with the heavy blues rock of Jawa, a band which, besides Huw, also featured Van Der Graff Generator bassist Nic Potter and Hawkwind keyboardist Simon House. All five Jawa songs here were written by Huw. Two of them, Jealousy and Damn Shame would be re-recorded later by the Lloyd-Langton group and one of them, Rocky Paths would be re-recorded by Hawkwind on the album Sonic Attack. And tying those two groups together at the very end of disc 1 is an unreleased 1979 cover of the old Hawkwind chestnut Hurry On Sundown, as done by the Lloyd-Langton Group. As I mentioned earlier, Huw loved instrumental music, and disc 2 is entirely instrumental. Half the disc is filled with the instrumental cuts from five of the Lloyd-Langton Group’s albums, and they glide through numerous styles, from acoustic tracks like the spacey jazz of Fur Kristy and the soft and beautiful Louise, to electric tracks like the slow burning, crying guitar sweep of Farewell and the upbeat psychedelic romp of Alien Jiggers. All in all, 13 songs from the Lloyd-Langton Group are included on this disc. After recording an album of classic music called Classical Guitar Tales in 2011, Huw’s life seems to have come full circle to the final acoustic tracks on this album, recorded not long before he passed away. Returning to his acoustic, English folk roots, but this time staying purely instrumental, these songs represent some of the most mature and moving music Huw ever recorded. The standout here is definitely the 10-minute long Fragile Journey, an acoustic classical/folk meditation that seems to cover an entire lifetime. The twin tracks of Into the Storm and Out of the Storm add some spacey electric guitar to the mix for a beautiful atmospheric voyage that tugs at the imagination. Another great track is Fast Lane to McFaden, its layers of both acoustic and electric guitar weaving together into a warm and rich sonic tapestry. Space rock lost one of its brightest lights when Huw passed away last year, but the world overall lost one of its finest musicians. Whether he was playing rock, country, blues, folk, classical or psychedelic music, Huw gave it his all, playing with a rare passion and skill. All of it can be heard on this stellar and essential collection. Thank you Huw, for all the great music!